Made from extra thick clear plastic, these trays can be washed and re-used year-round. Created for indoor or outdoor use, the classic tapered design adds a touch of style to any table, planter, or indoor garden. Give these a try as an elegant candy dish, candle holder, or serving tray. Each saucer has been cast with feet to elevate it off the surface it is placed on. This allows the tray to collect water without risking damage to any of your surfaces. CLEAR 6 INCH SAUCERS: Each package contains 20 clear plastic saucers. Each saucer has a 6 ¼ inch top diameter and a 4 inch base diameter. EXTRA THICK & REUSABLE: Made from a heavy-duty vinyl polymer and meant for both indoor or outdoor use. Washable and able to be re-used again and again! PROTECT YOUR SURFACES: Each saucer is equipped with feet, so that the tray is raised off of whatever surface it is set on. This extra height helps prevent water damage to your surfaces. MULTI-USE: Perfect as planters, containers, serving trays, garden flats, for growing succulents, and much more. 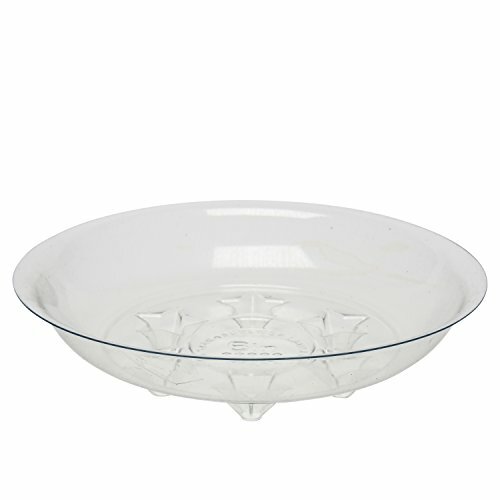 TAPERED & STYLISH DESIGN: Makes for a quick and elegant candy dish. Adds a touch of style as the base of a candle. If you have any questions about this product by Ashbrook Outdoors, contact us by completing and submitting the form below. If you are looking for a specif part number, please include it with your message.